Don't you hate when clothes shrink? For most clothing it's just inevitable after so many washes or rather times in the dryer. I don't worry too much about tops shrinking but when pants shrink, ugh. Let the hem down. Most pants have at least another inch in length that make up the hem. Use your seam ripper to undo this. Once that is done it could give at least a half inch, maybe more. To hem it again use your serger then hem up the serged length. If you don't mind a serger rolled hem then do that to get the most length out of this. Add fabric. Give your pants a new look by adding a cuff. 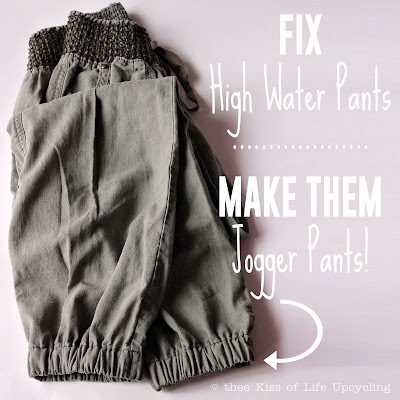 This is especially cute and easy for children's pants. Check this tutorial by You & Mie. Turn your pants into Shorts or Capris. 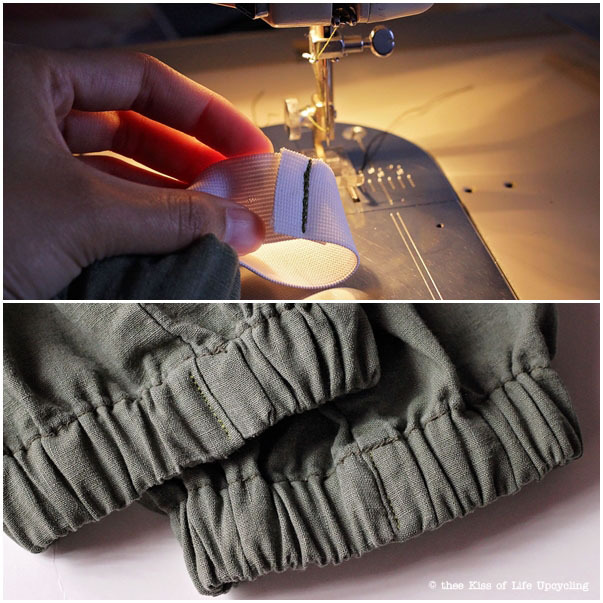 Patch Work Posse has a great tutorial here on how to make capris happen. And thennnnn there's my option. Add elastic. By adding elastic to the pre-existing hem or the one you create, you get this harem / jogger pants look. You also get a pants length that is pretty adjustable. You can wear them to your ankle or below the knee and anywhere in between. Of course this option though, best lends itself to pants that are not so skinny or straight legged. They should have a good width to them like a flare, bell bottom or wide leg. I have these olive green linen pants that I love, they're so comfy. Downside, they shrunk after a couple washes. So I added elastic to them. 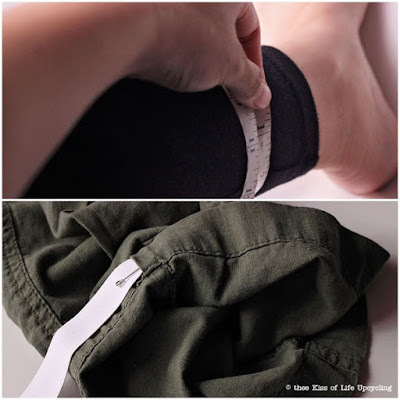 Luckily these pants have a wide hem that perfectly fits an inch wide elastic through. If your pants don't have a wide enough hem, then you'll have to make your own. 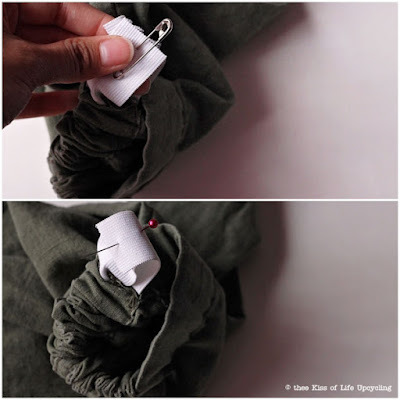 Create an opening by ripping a seam. If your pants have one side where the seam is double top stitched and thick, pick the other side so it's easier. Measure your leg for the width you want. For mine I wanted the pants to sit above the ankle but I measured the width of my leg higher than that so the elastic will stretch comfortably over that. I hope that makes sense. Next place a safety pin on one end of the elastic to keep a grip on it while you string it through the opening in the seam you made. Once your elastic is all the way through you want to place one end over the other, so they lay flat and pin it in place. It's important to make sure the elastic has not twisted itself when you were working it through. Now sew the elastic down, going over the seam a couple times. Then stretch out the elastic so the ruching is evenly distributed. Close the openings (where the elastic was strung through) with small seams just enough to close them. You're done. Keep on trekking wearing? Oh you get it. P.S. Always try to avoid throwing out clothes. Our planet doesn't need anymore of that garbage. If you can recycle it, do it but if not then at least donate it (Although, even donations center can only handle so much). With this case of high waters, yeah there's always people who are shorter than you, if doesn't fit you anymore it'll probably fit someone else. Someone will make it work but they're already your pants, you bought them and they fit your top half so why not you make it work for you. 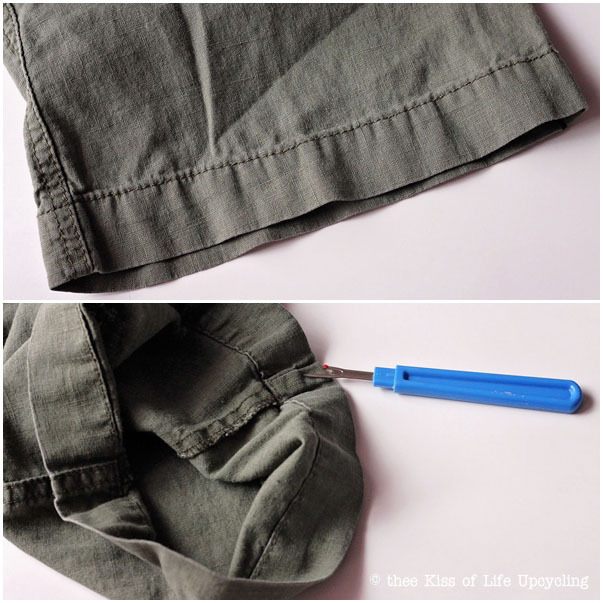 Give your pants a new look.